"In anticipation of the announcement of an updated iPad from Apple next Wednesday, some iPad owners are already generating quick cash from their older models." Seems appropriate to post this now that the new iPad is "supposedly" going to be announced on March 7th doesn't it? I have an original iPad that I'm thinking of selling so I read this article with interest, and I'm glad I did since it appears I'm going to be able to get $170 USD for it based on the info I provided here. 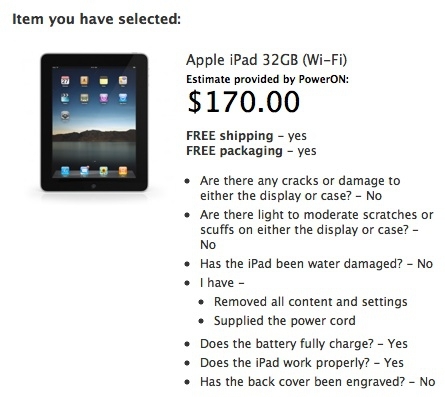 That will take a big chunk of the damage for the new iPad I'm guessing. There are other options listed in the article as well, so if you are considering selling, it's worth reading.